One hundred years ago, home construction practices were very different. Homes were generally built with the natural materials available within the immediate vicinity. As the shipping industry and prefabrication have modernized, so has the process of constructing a house. Cheap materials and accelerated construction have allowed entire communities to be built in record time and at more affordable prices. Many people are realizing, however, that speed and savings may not be worth the health risks. The result is an emerging trend toward healthy home building. But what, exactly, is healthy home building? If you’re thinking indoor air quality, it’s much more than that. A number of building materials have been linked to chronic illnesses that, until the last couple of decades, have been blamed on food, work, and many other catalysts, when the problem really lay within the physical structure of our homes. An unhealthy home can be linked to severe respiratory illness, allergies, chronic fatigue, attention deficit disorder, headaches and nausea, and possibly even cancer. What causes these health issues? A combination of building materials and building practices can be held accountable. With the invention of adhesives that were not available 70 years ago, cheaper and more readily available materials are widely used in modern construction. Particle board and plywood are manufactured with glues which contain formaldehyde, which is also used in the manufacture and preservation of carpeting and carpet padding. Synthetic plastics simulate wood grain trims and kitchen tiles. Polystyrene and fiberglass are used to manufacture insulation. Add to that the lists of paints, caulking, laminates, sealants and preservatives in a new home and the result is a potentially poisonous atmosphere with toxicity levels that can be extremely dangerous. Imagine that effect on a developing fetus, young child, senior citizen or average adult with immune deficiencies. Within the past ten years, more builders are recognizing the need to address the issues of Indoor Air Quality (IAQ) and occupant health. The Canadian Mortgage and Housing Corporation (CMHC) has even established The Healthy Housing Recognition Program which implements standards for healthy home building. Using alternative building materials is only part of the solution. Switching out carpeting for cork flooring and substituting real wood products for plastic simulations is only the beginning. Moisture barriers that prevent and inhibit the growth of mould, high efficiency ventilation systems on furnaces and air conditioning units, and even floor plans that take advantage of fresh air flow and natural lighting, are all part of building a healthy home. Because of the increased demand for non-toxic building materials, prices are on the decrease making healthy home construction more affordable. Purchasing energy efficient appliances, investing in sustainable energy systems (such as solar) and hiring a home builder experienced in healthy home construction, can result in a home that allows you to live a truly healthy life. Your home is your sanctuary and it should be a place where you and your family feel safe. 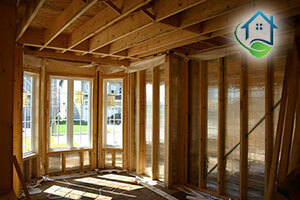 Ask your contractor about their healthy home building practices so that you can breathe a little easier.